What Do Americans Think About The Mueller Investigation Now That It’s Over? It has been nearly two weeks since Attorney General William Barr sent Congress his four-page summary of special counsel Robert Mueller’s investigation into Russian interference in the 2016 election. And while the full 300-plus page report hasn’t been released (Barr has pledged to release a redacted version of it by mid-April), enough polls have trickled in to give us an initial look at how the public has reacted to what we know so far. The verdict is still out on whether Americans believe the report has cleared President Trump of any wrongdoing. Barr’s summary of Mueller’s report said that the investigation did not conclude that the Trump campaign had colluded with Russia, and said that although Mueller had not charged the president with obstruction of justice, the special counsel wrote that “while this report does not conclude that the President committed a crime, it also does not exonerate him.” And — perhaps unsurprisingly, given the ambiguity of Barr’s summary — Americans have revealed mixed opinions in polls conducted after Mueller’s investigation concluded. In an NBC News/Wall Street Journal poll, 40 percent said they think Barr’s summary of the report has not cleared the president’s name, while 29 percent said it did clear him and 31 percent were unsure. About a third of Americans said it was “too soon” to say whether the president had been cleared, in a CBS News poll; another third said he had been cleared, and about a quarter said he had not been.1 And a CNN poll that didn’t give respondents an option to say they were still undecided found that a majority of Americans (56 percent) did not think that Trump and his campaign had been exonerated, while 43 percent thought they had been. However, there was a strong partisan split in how Americans answered. In that CBS News poll, 68 percent of Republicans thought that the report had cleared Trump’s name while only 9 percent of Democrats thought the same.The CNN poll also found a wide partisan split. 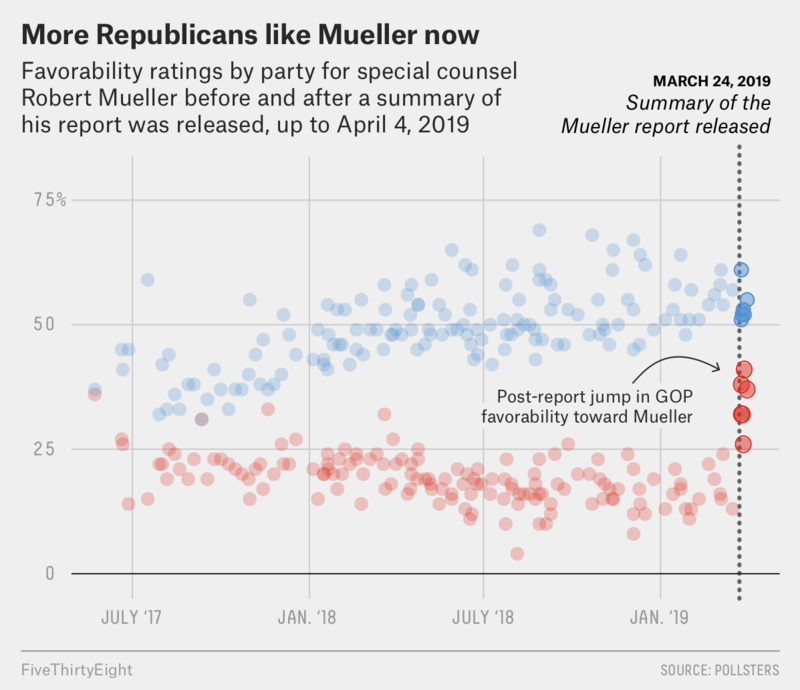 2 But while Americans are still unsure how to react to Mueller’s investigation now that it has ended, one clear trend has emerged: Republicans, who were taking a more and more negative view of the special counsel, now have a more favorable opinion of Mueller. On the other hand, polls show fewer Democrats have a favorable opinion of Mueller. Some of the shift in public opinion has been quite dramatic. For example, a Washington Post/Schar School poll conducted in February and then again the week after the investigation concluded found that the share of Republicans who approved of how Mueller handled the investigation went up by 25 percentage points, from 21 percent to 46 percent, whereas the percentage of Democrats who approved of Mueller’s work went down by 15 percentage points, from 77 percent in February to 62 percent in March. In the six polls that asked people whether they had a favorable or unfavorable view of Mueller in the past two weeks, we found a similar trend. At this stage, there is evidence that Americans’ opinion of Mueller and the investigation is changing, especially within political parties. But many people seem to be waiting for more information before they make up their minds as to whether Trump has been cleared. But the one thing the polls are certain about is that an overwhelming majority of Americans want the full report to be made public. According to a YouGov/Economist poll, 56 percent of Americans think it is “definitely” or “probably” true that Russia created and spread fake news stories to help Trump win the election, while 44 percent think that it is “definitely” or “probably” not true. Eighty-nine percent of Democrats said that they thought it was definitely or probably true, while only 26 percent of Republicans did. According to Barr’s summary of Mueller’s report, a Russian organization known as the Internet Research Agency did spread misleading information on social media that was meant to influence the election. 76 percent of New York City residents said they would not like to see Mayor Bill de Blasio, a Democrat, run for president in 2020, according to a Quinnipiac University poll. Only 18 percent said they would like to see him run. 45 percent of registered voters approve of pineapple as a pizza topping, according to a poll by Public Policy Polling. Thirty-five percent disapproved, and 20 percent were not sure. Younger people were more into pineapple than older people. A Morning Consult/Hollywood Reporter poll found that 28 percent of respondents had canceled a subscription to a streaming service after the series finale of a show they were fans of had aired. This could be a problem for HBO as its hit series “Game of Thrones” begins its final season this month. The poll also asked “Game of Thrones” fans who they think will likely die in the final season, but your humble correspondent does not know the difference between a Stark and Lannister, so you’ll have to check that out for yourself. A Gallup poll asked Americans whether they think the country is divided into “haves” and “have-nots.” Fifty-eight percent of Americans rejected this view, while 41 percent agreed with it. Fifty-seven percent of Democrats and 70 percent of black Americans said they think the country is divided that way. Only a quarter of Republicans agreed. According to a Quinnipiac poll, 42 percent of Americans think white supremacist groups pose an immediate threat to the United States, up 5 points from November, when Quinnipiac last asked the question. Twenty percent said they felt the groups posed a threat, but an immediate one. And 29 percent said they don’t pose a threat. The poll was conducted about a week after a deadly attack on two mosques in Christchurch, New Zealand. It is rare to see agreement on issues across the political aisle these days, but according to a Pew Research Center survey, 77 percent of Americans, including 71 percent of Republicans and Republican-leaning independents and 82 percent of Democrats and Democratic-leaning independents, agree that membership in NATO is good for the U.S.
A majority of Russians say that the annexation of Crimea brought “more good than harm,” according to a poll conducted in March by the Levada Center and the Chicago Council on Global Affairs. Russia annexed the peninsula in 2014, leading the European Union, the U.S., and other countries to issue sanctions against Russia. But a majority of Russians have said the annexation is a good thing since March of 2015, when Levada-Center first asked the question. According to FiveThirtyEight’s presidential approval tracker, 42.1 percent of Americans approve of the job Trump is doing as president, while 52.6 percent disapprove (a net approval rating of -10.5 points). At this time last week, 41.9 percent approved and 52.8 percent disapproved (for a net approval rating of -10.9 points). 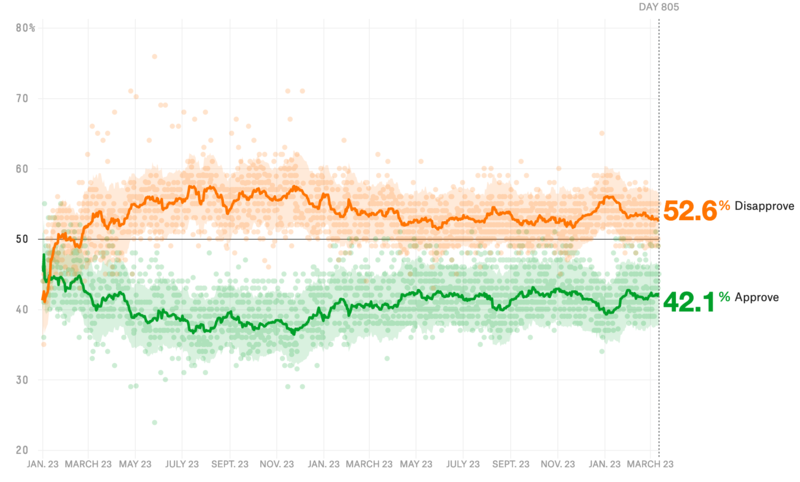 One month ago, Trump had an approval rating of 42.1 percent and a disapproval rating of 53.4 percent, for a net approval rating of -11.3 points. Seven percent said they didn’t know. The NBC/Wall Street Journal poll did not break out results by political party.